With a stay at Nite Star Inn & Suite, you'll be centrally located in Arlington, within a 5-minute drive of Six Flags Hurricane Harbor and Arlington Convention Center. This motel is 0.6 mi (0.9 km) from Six Flags Over Texas and 2.1 mi (3.4 km) from Globe Life Park in Arlington. Make yourself at home in one of the 92 air-conditioned rooms featuring refrigerators and plasma televisions. Wired and wireless Internet access is complimentary, while 37-inch flat-screen televisions with cable programming provide entertainment. Private bathrooms with shower/tub combinations feature complimentary toiletries and hair dryers. Conveniences include safes and desks, as well as phones with free local calls. Enjoy recreational amenities such as an outdoor pool and a fitness center. This hotel also features complimentary wireless Internet access, gift shops/newsstands, and wedding services. Spending a day of fun is easy with the complimentary theme park shuttle. Make yourself at home in one of the 134 air-conditioned rooms featuring refrigerators and MP3 docking stations. Your bed comes with premium bedding, and all rooms are furnished with sofa beds. Flat-screen televisions with cable programming provide entertainment, while complimentary wireless Internet access keeps you connected. Private bathrooms with shower/tub combinations feature designer toiletries and hair dryers. 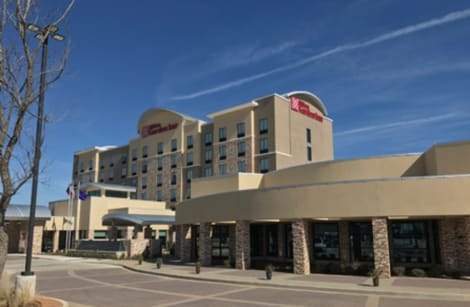 Daily Mandatory Charge will be added to the room rate and includes: 2% per night Arlington Tourism PID FeeWhen you stay at the new Hilton Garden Inn Dallas/Arlington South hotel, you’ll be near the area’s most exciting things to do. We are not far from AT&T Stadium, Globe Life Park, Six Flags Over Texas and Hurricane Harbor. Spend a day shopping at the nearby Arlington Highlands or The Parks at Arlington Mall. 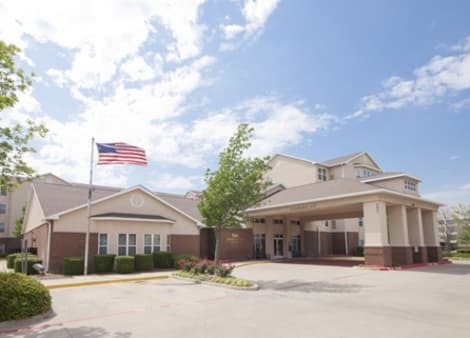 Our hotel is just off of I-20, providing easy transport throughout the metroplex. After a busy day, settle in for a peaceful night’s sleep in a comfy bed with crisp white bedding.Wake up to breakfast in The Garden Grille & Bar each morning. With a fitness center and indoor heated pool, keeping up your routine is a cinch. When you’re ready for dinner, grab a table at The Garden Grille or choose from over 30 local restaurants. Looking for space to host your next business meeting or social gathering? Our hotel features over 5,000 sq. ft. of event space, accommodating up to 350 guests in modern style. Welcome to the DoubleTree by Hilton Hotel Arlington DFW South. Set in the Entertainment District, our new hotel is a 5-minute drive to the Arlington Convention Center and just 2 miles from Six Flags Over Texas, AT&T Stadium and Globe Life Park. 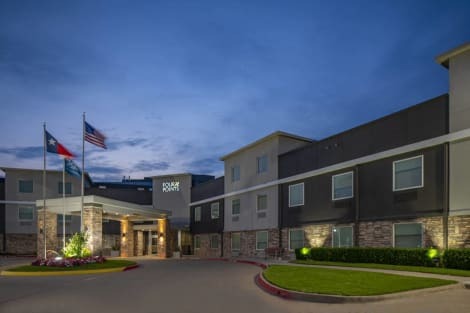 Our location near I-30 is also perfect for exploring restaurants, shops and entertainment across the Dallas-Fort Worth metroplex while you're here.We'll see you at check-in with a signature warm DoubleTree chocolate chip cookie. Get settled in a stylish guest room with complimentary WiFi, a 43-inch HDTV, mini-refrigerator, coffeemaker and workspace. Upgrade for a room with a pool view, patio or balcony.A full buffet breakfast will start your day right, and The Brass Spur Bar & Grill is a stylish place for dinner and cocktails. Our Arlington hotel features the Made Market 24-hour pantry with fresh salads, sandwiches and snacks, and guests can order room service any night from 5:00 pm - 10:00 pm.Relax after a long day in a cabana by our outdoor pool. The complimentary fitness center is open 24 hours for a full-body workout with weights and cardio machines, and our complimentary business center/connectivity area is always available.Host an event or celebration for up to 250 guests in 6000 sq. ft. of Arlington, TX meeting space. Our elegant ballroom measures 3000 sq. ft. – plenty of dance floor space for your wedding reception. For your convenience, the hotel offers a complimentary shuttle to DFW Airport, just 15 minutes away. 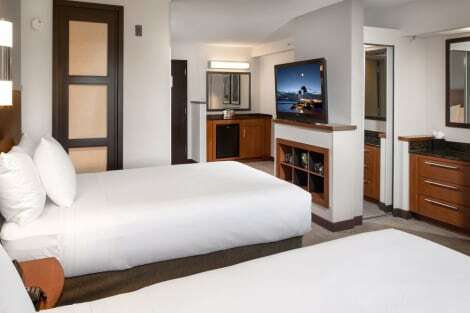 Daily Mandatory Charge will be added to the room rate and includes: Arlington Tourism PID FeeA Convenient South Arlington HotelEnjoy thoughtful amenities and all the comforts of home at our new Homewood Suites by Hilton™ Dallas Arlington South hotel. 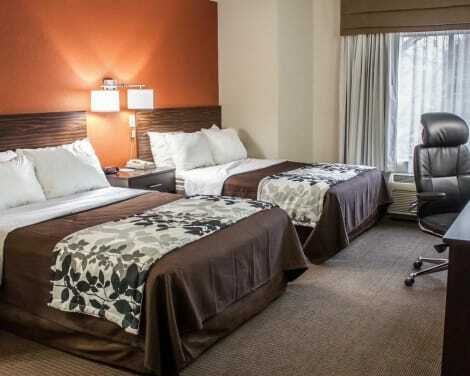 Our warm, inviting hotel is located off of I-20 near Arlington’s best shopping and entertainment destinations. Cheer on your favorite team at nearby AT&T Stadium or GlobeLife Park – both just 8 miles away. Update your look at the Arlington Highlands, an outdoor mall with plenty of popular retailers and restaurants. Whether you’re here for business or attending a graduation at the University of Texas at Arlington, our all-suite hotel provides the location and amenities you need to make your trip a success.Start each morning with free hot breakfast served daily as well as an evening social* served Monday through Thursday. Our studio suites provide a full kitchen, full-sized refrigerator and complimentary WiFi. Outside your room, you’ll find a business center, fitness center, outdoor pool and sport court. Let our friendly staff help you with anything from dinner recommendations to grocery shopping. Our Arlington hotel is perfect for your next small to medium event with 2 meeting rooms and modern amenities. *Local and state laws apply. lastminute.com has a fantastic range of hotels in Arlington, with everything from cheap hotels to luxurious five star accommodation available. We like to live up to our last minute name so remember you can book any one of our excellent Arlington hotels up until midnight and stay the same night.